The VPL-DX127 is packed with features optimised for the business and education markets at a reasonable price. The projector is compact and lightweight, with its simple design making it very easy to set up. Sony 3LCD BrightEra™ panel technology provides bright and colourful projection. Plenty of interfaces allow easy connection, while a choice of Picture Modes optimises viewing with any source – slide presentations, PC documents, pictures or videos. There’s a range of smart energy-saving features built in, including auto power saving function. And with a recommended lamp replacement time of 10,000 hours, downtime and maintenance costs are minimised. The VPL-DX127 has a compact and lightweight body with a small footprint of approximately 315 x 75 x 230.5 mm (12 13/32 x 2 15/16 x 9 1/16 inches) and a light weight of approximately 2.6 kg (5.8 lb). 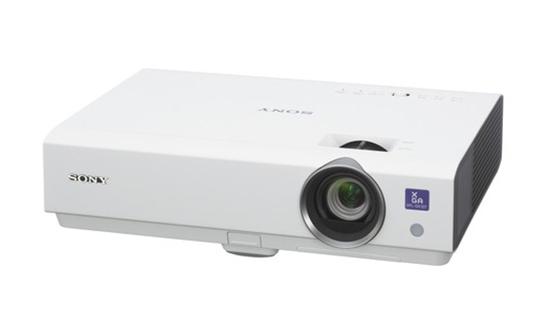 This compact, lightweight projector is convenient for carrying around a meeting room or classroom. Widescreen XGA (1280 x 800) 4:3 screen resolution, 3LCD BrightEra™ natural and vivid colour images, plus various Picture Modes for optimising image quality, make the projector one of the best in its class. Thanks to the optical system projecting three basic colours constantly, the projector offers excellent light efficiency, ensuring colourful and bright images. Sony's BrightEra™ panels deliver improved panel light resistance, higher resolution, high brightness and increased panel reliability. High colour reproducibility is important especially when using colourful content, such as materials used in classrooms. It is possible to customise the input names that appear in the input menu on screen. It allows users to understand clearly what equipment is connected.